This entry was posted in Breeding, Feral bees, Treatment free, Varroa resistance and tagged locally adapted bees by Erik. Bookmark the permalink. averaging percentages this way is mathematically incorrect. If done correctly, the outcome is quite different. If “Colonies” is annual total, then the average losses would be 15 % vs. 11 %. 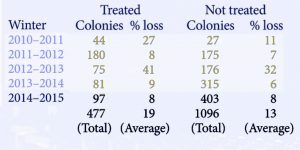 If “Colonies” is annual losses, then the average losses would be 10 % vs. 8 %. Either way – in my opinion the delta of only 4% or 2 % is statistically NOT relevant! correct, the statement that losses of treated vs not treated colonies is different, can not be proven statistically. Anyway, in my eyes the main story is that, this is another example that bees can live without treatment. And the conclusions Erik made how they proceed to do so…. Very nice! Again this underlines, that it is important to control drones, but allow for natural reproduction. In many areas this is hard to achieve, as most beekeepers unfortunately treat and made it worse, rather than better. I have to distribute my own swarms, having no ferals, but maybe I will spread some swarms with elgon genetics mixed with local stock? Create some ferals? Stop doing IPM? Very nice this would be. Who knows what will be. It already started. Wish I would have a bee inspector like that to work with. It would be so much easier. The comments to the video are very interesting, they speak of the uncertainty of how the laws are executed. Stand up to your rights! It´s not prophylactic treatments today! Know your thresholds! Only treat the susceptibles ( hopefully without chemicals) and propagate the mite fighters! Even Dee Lusby’s bee colonies are dying, if left to their own business without a beekeepers interference for about 3 years (due to age and healh problems of the lady-beekeeper). Not to speak of the bad temper (or other unwanted characteristics) of her or for instance Mr. Kefuss’ bees. The brood combs of the many (Pseudo-)VSH-Breeders I have seen so far look like those of colonies infected with European Foulbrood or other brood diseases. For instance it’s a well known fact, that queens of certain Luxembourg breeders are susceptible for chalkbrood. It’s very distressing that even Erik presented pictures of shot-gun-brood-frames in this blog. Varroa does not(!) invade cells in rows of 4 cells in a line! So one could say, the mites are cleared of the cells unintentionally – kind of a “collateral damage” to the Varroa-population – within (Pseudo-)VSH-hives! And last but not least: (Pseudo-)VSH-Hives aren’t the ones known for record results in terms of bee- or honey production. Which makes perfectly sense: a pupa ripped out of its cell will never become a flying bee. If you mean this seriously, I would say the argumentation is very lousy to prove that fact. Please provide more facts that support your hypothesis. 2. As an example of unwanted characteristics you mentioned chalkbrood or European foulbrood, that you claim are more existing in resistant bees especially in Luxembourg (you name those “Pseudo VSH Breeders”). You even assume that those “Pseudo VSH breeders” are not able to differentiate between shot gun pattern caused by susceptible bees and chalkbrood pattern. Then you generalize “your observation” – which nobody can prove here – and argue that even Erik presenting “short gun pattern”. Implying that the short gun pattern Erik presented is chalkbrood or European fouldbrood. The other statements are too much taken out of context…Please be more precise and argue in whole train of thoughts… next time. In which county’s are the apiaries? Gwynedd in Wales is situated in the north-western part at the cost partly.